We will help you identify your specific coverage needs and then work with underwriters to design and negotiate the best terms and coverages. 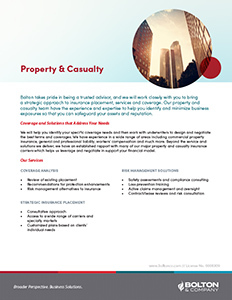 We have experience in a wide range of areas including commercial property insurance, general and professional liability, workers’ compensation and much more. Beyond the service and solutions we deliver, we have an established rapport with many of our major property and casualty insurance carriers which helps us leverage and negotiate in support your financial model.